A sloppy travel plan and an unconfirmed cancellation of expensive hotelrooms were the reasons I rushed to Weimar and Leipzig for a blitz – visit over a weekend. Rather drive 1200 km than waste 200 euro of good travel money. 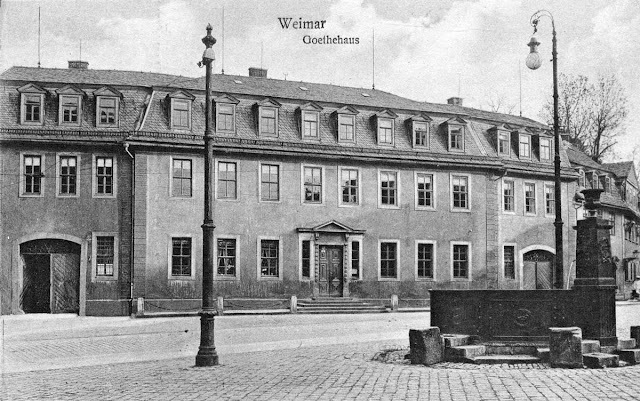 My wife and I arrived in Weimar in the late morning, bought immediately our entrance tickets to the Goethe house for the afternoon visit and went then for a short lunch of pastries and geback. The weather was splendid. The entrance of the house, passes over a series of “magical” stairs. They are only half as high as normal steps and very deep and wide and stepping on them gives an exhilarating feeling as one climbs effortless towards the front door. An idea Goethe got in Rome, the guide explains, and designed as to instill in the visitor a feeling of hospitalty up to the front door with the “Salve” ( welcome ! ) words laid in the wood in the floor. Inside the house, each pastel – painted room has a magnificent dark and creaking wooden floor. The rooms are decorated with copies of classical statues, paintings and other artworks Goethe hoarded during his long life. As you walk through the different rooms of the house, you get a good impression of Goethe and his life. Much more so, I would say than Safransky’s biography of Goethe, which I could not finish. For some reason, his large book collection is guarded behind bars. Goethe’s sleeping room contains his small bed and the cosy seat in which he died…of old age, closing his eyes after a last glimpse at all the beautiful things he collected. Even the classy decency of his passing away makes one jealous. The window at which he looked as he asked for more light gives out on a splendid garden. After the Goethe house we tried to grab a visit of the Anna Amalia library and its sumptuous rococo room, but the visits were sold out for the next weeks. Leipzig is a less Romantic place than Weimar, but it was here in the fifteenth century Auerbach Keller at the Mädlerpassage, Goethe’s favorite when he was a student in Leipzig, that the famous man got his idea for a Faust novel. We had our dinner there and marveled at the wall paintings describing several scenes of the Faust legend. We finished our blitz – trip the next day with a short visit to the Thomaskirche where Bach was Kapellmeister for many years and where his remains, after being moved around the town for a while, were finally laid to rest. A great two days !